Sierra Leoneans on Saturday November 7, 2015, at home and abroad, sky-rocketed their hands, shouting Alleluia! When WHO (World Health Organisation), Dr. Anders Nordstrom, Country Representative, declared the end of the Ebola outbreak in Sierra Leone at the jam-packed Bintumani Conference Hall in Freetown. In the streets of Freetown, taxis, poda-podas, okada riders and private vehicles were seen jubilating, hooting their horns, trumpeting with optimism the end of the outbreak. The country started enjoying the road to the ‘New Phase of 90 days’ – 90 clear days means that Ebola is over. And then an unexpected new case of Ebola was announced in early January 2016. 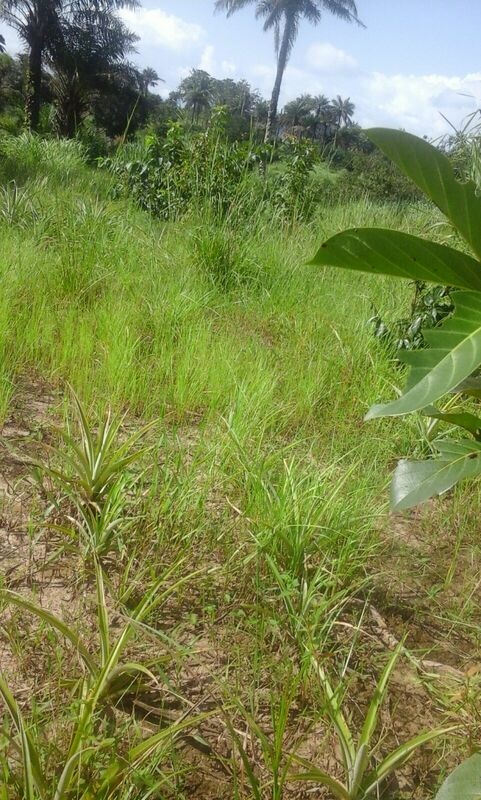 The case, believed to have emerged from the Kambia district and identified in Magburaka in the Tonkolili district, scaled up to a point of mistrust and confusion by local residents. It became very challenging in some quarters, particularly within communities in the two districts – Tonkolili and Kambia – where ignorance and mistrust sadly led to violence. Leoneans that we recorded the first Ebola case on May 24, 2014, with a total number of 8,704 infected and 3,589 deaths. Of those who tragically lost their lives, 221 were health care workers. But most importantly, Nordstorm described the new 90 days phase as critical, calling for strategic surveillance and response to any potential Ebola flare ups and threats. The world had never faced an Ebola outbreak of this scale and magnitude, and the world has neither seen a nation mobilizing its people and resources as Sierra Leone did. The power of the people of Sierra Leone is the reason why we could put an end to this outbreak today, Andrews Nordstrom told the World. The Ebola history is a forward-backward- forward- virus threat, but we need to maintain the trust that we had in the health system, its rapid response teams and current strong community involvement. Mistrust will not help us consolidate the gains of the existing systems to manage future risks. Remember the outbreak has devastated families, the health system, the fast growing economy and social structures. All need to recover and heal. Together we fight is the answer. Although I sympathize with victims of the unfortunate situation of the recent Bamoi- Luma, Kambia crisis, we now have a unique opportunity to restore hope and despair in the health system and to support the Ministry of Health and the government to kick Ebola once and for all. The whistle is blown and the battle is won. A decade-long civil war which ended in 2002 has left Sierra Leone’s 5.4 million people among the poorest in Africa. Although the country has achieved peace in recent years, poverty and unemployment remain massive challenges and Sierra Leone remains bottom of the UN’s league for human development. Added to what they are already going through, Ebola has been the ultimate curse. A few months ago, the Olney Newton Link was asked if it could fund a Preschool/Day Care Centre in Newton (read more about the Preschool under Projects”. The Centre would help those who had been affected by Ebola and were trying to look after orphans whilst also trying to earn a living and grow food to feed their family. This support is most desperately needed by the women – communities rely heavily on subsistence farming and the majority of the crop planting and harvesting is done by women. Because Ebola is a disease passed on through bodily contact, authorities advised that gatherings of people should be avoided. This has meant that farming, relying purely on human power and group work to cultivate and harvest the land, has been massively affected. Fear of disease transmission, quarantine rules, illness and death has meant that the production of food across the Country has been badly reduced. In the past, people have taken their produce to market and their income has come from sales within the towns and cities. Since the disease hit, those braving a trip to the market have been poorly rewarded – customers who have ignored warnings over social gatherings, still have had little money to spend. Work environments have been closed down and salaries have been non-existant. We’re told that people have even resorted to using rehydration fluids as food substitutes. Farmers in Newton have not had the money to buy seeds. Land is not being prepared and cultivation has stopped. Real food hardship is expected. 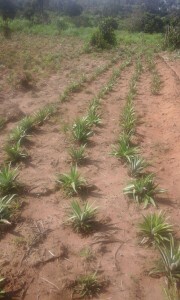 The photographs above and below are of a Pineapple Plantation which is being run by the women of Newton. The top photo shows this year’s crop, the bottom is last year’s crop. It was begun two years ago but unfortunately has suffered due to Ebola. They have started again and have already planted 10,000 suckers – they would like to plant 10,000 more! Some of the fruit will go to the local juice factory and some will be sold in the markets. It is so important that we help them to build a Preschool – this will look after the children and allow them to work in the fields and get those pineapples grown.